Years ago, an architect friend of mine redid two bathrooms in his home. He and his partner had been collecting autographed photos of famous people for years. Tom decided to get all of the 8×10 black and white pictures put into simple black frames, and he hung them next to each other on all four walls of the powder room. His bathroom artwork was a fantastic effect! But he once confided to me that when they would have a party, guests weren’t allowed to “camp out” in the bathroom while they looked at all of the photos. Tom’s master bathroom artwork was a different story. He wallpapered the walls with old, faded blueprints, then applied several coats of urethane. Over the toilet, he hung a beautifully-framed poster of Frank Lloyd Wright’s “Fallingwater” in the fall. The brilliant reds, golds, and yellows of the leaves were more apparent against the blueprints. Bathroom artwork isn’t limited to framed photos or posters, though. The bathroom featured in today’s tip has a beautiful waterproof work of art: A custom sandblasted shower door. The Homeowners wanted a sophisticated beach theme for this bathroom. They chose Ann Sacks tile with bas relief sea creatures such as sand dollars, starfish, shells, coral, and seahorses. The artist did a masterful job capturing the sea waves rolling in, the clouds, the palm tree, and the sand texture. She added a starfish on the sand that looks like the starfish on an adjacent accent tile. In this same bathroom that was designed for the family and guests, there’s a three-dimensional whimsical framed wall sculpture by Michael Bedard entitled “Sitting Ducks”. It’s not unusual for first-time guests to exit the bathroom chuckling. Two of the ducks are relaxing on the boardwalk. The third duck is looking at bullet holes over his left shoulder. 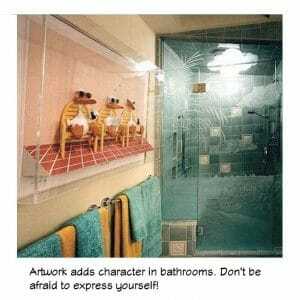 Whether it’s serious or whimsical, inexpensive or a budget-stretcher, art definitely has a place in all bathrooms. See the pictures and description of this project. Read about Diane Plesset’s philosophy, training, and experience.